For the Confederate States Army division during the American Civil War, see Walker's Greyhounds. The 36th Infantry Division ("Arrowhead"), also known as the "Panther Division" or "Lone Star Division," is an infantry division of the United States Army and part of the Texas Army National Guard. It was organized during World War I from units of the Texas and Oklahoma National Guard. It was reactivated for service for World War II 25 November 1940, was sent to the European Theater of Operations in April 1943, and returned to the Texas Army National Guard in December 1945. The 36th Infantry Division's combat service identification badge and shoulder sleeve insignia. A unit of the 36th Infantry, the 2nd Battalion, 131st Field Artillery, was detached and sent to the Pacific just before the outbreak of war in late 1941. Captured by the Japanese and forced into slave labor, its fate was unknown for most of the rest of World War II, resulting in the name of The Lost Battalion. The 36th Infantry Division was reconstituted in a May 2004 reorganization of the 49th Armored Division. The division has been active in search and rescue efforts following natural disasters, as well as supporting the rebuilding of affected areas. The 36th Infantry Division was activated as the 15th Division, an Army National Guard Division from Texas and Oklahoma. The new unit also received a new commander, Major General Edwin St. John Greble. The designation was changed to the 36th Division in July 1917. The final composition of the 36th Division consisted of the 71st and 72nd Infantry Brigades, the 141st and 142nd Infantry Regiments belonging to the 71st. The 143rd and 144th Infantry Regiments were attached to the 72nd Brigade. Also belonging to the 71st was the 132nd Machine Gun Battalion. Similarly, the 72nd received the 133rd Machine Gun Battalion. The 61st Field Artillery Brigade, 131st, 132nd, and 133rd Field Artillery Regiments, 111th Regiment Engineers, 111th Signal Battalion and the 111th Supply Train comprised the rest of the 36th Division. The unit trained at Camp Bowie, Texas, then in Fort Worth. The unit was sent to Europe in July 1918 and conducted major operations in the Meuse-Argonne Offensive. On 9–10 October, the unit participated in heavy combat near the village of St. Etienne. Following this victory, which included the capture of several hundred men and officers of the German Army, as well as artillery, the unit launched an assault near an area known as "Forest Farm." The eventual victory brought World War I to an end, yet during World War I, the division suffered 2,584 casualties, 466 killed in action and 2,118 wounded in action. The unit was inactivated in June 1919. The 36th Division was called up again for active federal service on 25 November 1940, during World War II (although the United States was neutral at this stage), at San Antonio, Texas, departing for its mobilization station at Camp Bowie, Texas, on 14 December 1940. The division commanded by Major General Claude V. Birkhead, moved to Brownwood, Texas, on 1 June 1941, where it participated in the VIII Corps Brownwood Maneuvers until 13 June 1941. The division then returned to Camp Bowie. The division then moved to Mansfield, Louisiana, and took part in both the August and September 1941 Louisiana Maneuvers. The division, now commanded by Brigadier General Fred L. Walker, a Regular Army officer from Ohio, then returned to Camp Bowie on 2 October 1941, where it was reorganized from a square division into a triangular division on 1 February 1942 and redesignated the 36th Infantry Division, just weeks after the United States entered World War II, as a result of the Japanese attack on Pearl Harbor on 7 December 1941. As a result of this reorganization, the 144th Infantry, plus numerous supporting units, were transferred out of the division. The division then moved to Camp Blanding, Florida, on 19 February 1942, and participated in the Carolina Maneuvers between 9 July 1942, and 15 August 1942. The division then was staged at Camp Edwards, Massachusetts, on 17 August 1942, for its port call to the European Theater Of Operations (ETO). During its time at Camp Edwards, the division conducted mock assaults of Martha's Vineyard Island in preparation for future amphibious operations. The division departed the New York Port of Embarkation (NYPOE) on 2 April 1943, for service in the Mediterranean Theater of Operations (MTO). 753rd Tank Battalion (15 August 1944 – 26 December 1944); (4 March 1945 – 29 March 1945); (29 April 1945 – 13 June 1945). 636th Tank Destroyer Battalion (15 August 1944 – 29 March 1945; 29 April 1945 – 13 June 1945). 822nd Tank Destroyer Battalion (29 April 1945 – 1 May 1945. 443rd Anti Aircraft Artillery Battalion (AW)(7 December 1944 – 13 January 1945). 442nd Regimental Combat Team (11 September 1944 – 13 October 1944). The 36th Division landed in French North Africa on 13 April 1943, and trained at Arzew and Rabat. However, the training was hampered by the need to supply guards for some 25,000 Axis prisoners of war (POWs) who had surrendered at the conclusion of the Tunisian Campaign in May. It was assigned to Major General Ernest J. Dawley's VI Corps, part of the Fifth Army, but attached to the Services of Supply, North African Theater of Operations, United States Army (NATOUSA), for supply. The 36th Division was originally intended to take part in the Allied invasion of Sicily, codenamed Operation Husky, but Lieutenant General George S. Patton the Seventh Army commander, preferred to use experienced troops instead and the 36th Division remained in North Africa. The Fifth Army was commanded by Lieutenant General Mark W. Clark, who knew the 36th Division well from his time as chief of staff to Lieutenant General Lesley J. McNair, commander of Army Ground Forces, and specifically chose the 36th Division, rather than the more experienced 34th Infantry Division, together with the British 46th and 56th Infantry Divisions, to spearhead the Allied assault landings at Salerno, Italy, which was given the codename of Operation Avalanche. A U.S. Navy Landing Ship-Tank (LST-1) landing American Army troops—possibly from the 36th Division—on an Italian beach, via a causeway. Note: This photograph is believed to have been taken during the Salerno landings in September 1943.. The division first saw action, in the Italian Campaign, on 9 September 1943. It was the first U.S. combat unit to fight on the European continent when it landed by sea at Paestum and fought in the Battle of Salerno against intense German opposition. The Germans launched numerous fierce counterattacks on 12–14 September, but the 36th, which at one stage during the battle was holding a 35-mile sector of the front (six times more than a full-strength infantry division was able to hold), repulsed them with the aid of air support and naval gunfire, and, with the help of paratroopers of the 504th Parachute Infantry Regiment, advanced slowly, securing the area from Agropoli to Altavilla. After sustaining over 4,000 casualties in its first major action, the division spent the next few weeks behind the lines, where it remained in the Fifth Army reserve, absorbing replacements and training for future combat operations. Despite the heavy losses, the 36th Division was considered to have fought well, and four men were awarded the Medal of Honor. The 36th Division returned to combat in mid-November, after six weeks of rest, now under Major General Geoffrey Keyes' II Corps command. It captured Mount Maggiore, Mount Lungo, and the village of San Pietro despite strong enemy positions and severe winter weather. This grueling campaign against the Bernhardt Line was marked by futile attempts to establish a secure bridgehead across the Gari River, erroneously identified as the Rapido on 1 January 1944, to 8 February. The division attacked across the Gari River on 20 January but was harshly repulsed by the 15th Panzer Grenadier Division, and the 141st and 143rd Infantry Regiments were virtually destroyed and the attack was stopped on 22 January. In 48 hours the 36th Division had sustained 1,681 casualties, 143 of them killed, 663 wounded, and 875 missing, out of almost 6,000 men who took part. Many of the casualties consisted of newly arrived replacements who were poorly trained. German losses were minimal, with only 64 killed and a further 179 wounded. A company commander in the 143rd Infantry said, "I had 184 men. Forty-eight hours later, I had 17. If that's not mass murder, I don't know what is." Strong controversy flared among the officers of the division and Lieutenant General Clark, the Fifth Army commander, was severely criticized for having ordered a difficult frontal attack and was accused of having caused the disaster. After the war Congress, urged by veterans of the division, conducted an investigation into the causes and responsibility for the defeat on the Gari River. Clark was absolved of blame and he personally believed the attack to be necessary, in order to attract German reserves from Northern Italy to prevent their use at Anzio, where an amphibious assault, codenamed Operation Shingle, was being launched by Anglo-American forces in an attempt to outflank the Winter Line, capture the Italian capital of Rome and potentially force a German withdrawal away from their formidable Winter Line defenses. However, the German reserves identified in Northern Italy had already been drawn forward onto the front of the British X Corps during the First Battle of Monte Cassino a few days before, thus making the 36th Division's assault unnecessary, although this was unknown to Clark at the time. After assisting the 34th Infantry Division in the attack on Cassino and fighting defensively along the Gari River, the severely depleted 36th withdrew from the line on 12 March, for rest and recreation. 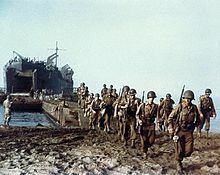 The division arrived by sea at the Anzio beachhead on 22 May, under the command of Major General Lucian Truscott's VI Corps, to take part in Operation Diadem, with the breakout from the beachhead commencing the following day. It drove north to capture Velletri on 1 June, and entered Rome on 5 June 1944, the day before the Normandy landings. Pushing up from Rome, the 36th encountered sharp resistance at Magliano, but reached Piombino on 26 June, before moving back to Paestum for rest and recreation. In July Major General Walker, who had commanded the 36th Division since September 1941, was replaced by Major General John E. Dahlquist. On 15 August 1944, as part of the U.S. 6th Army Group, the division made another amphibious assault landing, against light opposition in the Saint-Raphaël-Fréjus area of southern France as part of Operation Dragoon, the Allied invasion of Southern France. A rapid advance opened the Rhone River Valley. Montelimar fell, 28 August, and large German units were trapped. On 15 September, the division was attached to the French First Army. The 36th advanced to the Moselle River at Remiremont and the foothills of the Vosges. On 30 September, the 442nd Regimental Combat Team (442nd RCT, a Japanese-American unit) was assigned to the 36th to help shore up the division. The 442nd was subsequently used to spearhead the capture towns of Bruyères and Biffontaine where they faced stiff opposition. On 24 October the 143rd Infantry relieved the 100th and 3rd Battalion who were sent to Belmont, another small town to the north, for some short-lived rest. On 23 October the 1st Battalion, 141st Infantry were cut off just beyond the town or Biffontaine. On 27 October the 442nd RCT was called back in to save this Lost Battalion. The 100th fielded 1,432 men shortly before, but was now down to 239 infantrymen and 21 officers. The 2nd Battalion was down to 316 riflemen and 17 officers, while not a single company in the 3rd Battalion had over 100 riflemen; the entire 100th/442nd Regimental Combat Team was down to less than 800 soldiers. On 13 October 1944, when attached to the 36th Infantry Division, the unit was at 2,943 rifleman and officers, but in only three weeks 140 were killed and 1,800 were wounded, while 43 were missing. For this action, the 442nd RCT would earn 3 of its 7 Presidential Unit Citations. In a grinding offensive, the division crossed the Meurthe River, breached the Ste. Marie Pass and burst into the Alsatian Plains. The enemy counterattacked, 13 December 1944, but the 36th held the perimeter of the Colmar Pocket. Two days later, the division was released from attachment to the French First Army, and returned to the control of VI Corps, now under Major General Edward H. Brooks, under the Seventh Army, commanded by Lieutenant General Alexander Patch. The German counterattacks out of the Colmar Pocket were so fierce, that at times, the field artillery was forced to fire over open sights at point blank range to stop them. On 20 December 1944, the division resumed the attack, advancing northward along the Rhine River to Mannheim meeting heavy resistance at Haguenau, Oberhofen, and Wissembourg. In this action Company "G" of the 143rd Infantry received a Presidential Unit Citation. On 27 December 1944, the division was reassigned to Major General Frank W. Milburn's XXI Corps of the Seventh Army, and was pinched out and returned to Seventh Army reserve on 30 December 1944. On the afternoon of 30 October 3rd Battalion broke through and reached 1st Battalion, 141st, rescuing 211 T-Patchers at the cost of 800 men in five days. However, the fighting continued for the 442nd as they moved past the 141st Infantry. The drive continued until they reached Saint-Die on 17 November when they were finally pulled back. The division was taken out of the line for the first time since it had landed in the south of France. On 3 January 1945, the division was reassigned to Major General Wade H. Haislip's XV Corps. In January 1945, the division was reassigned to VI Corps. It returned to the line early March. The 36th was reassigned to the Seventh Army on 29 March 1945, and moved to the Danube River on 22 April 1945. The 36th Division has been recognized as a liberating unit for its work securing the subcamps of the Dachau concentration camp system. The 36th Division was reassigned to the XXI Corps on 27 April 1945, and attacked the Künzelsau area on the 30th. Members of the 36th Division's 142nd Infantry arriving as reinforcements on 5 May tipped the Battle for Castle Itter in favor of a combined U.S. Army/Wehrmacht defense against a Waffen SS attack, the only time German and American forces fought side-by-side in World War II. By 8 May 1945, otherwise known as Victory in Europe Day (VE-Day), the 36th Division was based in Kitzbühel, Austria where it captured Generalfeldmarschall- Gerd von Rundstedt, the commander of all German Armed Forces on the Western Front, and its final station was at Kufstein, Austria on 14 August 1945. After 400 days of combat, the 36th Infantry Division returned to the United States in December 1945. It was returned to the Texas Army National Guard on 15 December 1945. The 2nd Battalion, 131st Field Artillery, long with the rest of the 36th Infantry Division, was mobilized for federal service on 20 November 1940. Earmarked as part of the reinforcements to U.S. Army troops in the Philippines, the Battalion was detached from the 36th Infantry and sailed on the USS Republic on 21 November 1941 for Pearl Harbor. From there it was diverted to Australia, learning of the surprise attack and U.S. entry into World War II en route. Before the end of the month the Battalion was bound for the island of Java in the Dutch East Indies. It took part in the Battle of Java and fought fiercely at Porong with several other Allied units until it was captured by the Japanese. Information on the unit's fate after the Dutch surrender in Java failed to reach the U.S. government, resulting in its subsequent nickname, "The Lost Battalion." As prisoners, the men were forced to work in Burma and Thailand as slave laborers on the Burma-Siam "Death Railway" of The Bridge on the River Kwai fame, as well as coal mines, docks and shipyards in Japan and other southeast Asian countries. Conditions were poor, treatment harsh, and mortality exceptionally high. Others died in U.S. submarine attacks en route to Singapore and Japan, and more yet were killed by American bombers. It was through debriefing of some survivors of the POW convoys who had been rescued by U.S. submarines that the Government first learned of the unit's fate. When liberated, the men were scattered throughout Southeast Asia in Java, Singapore, Burma, Thailand, French Indo China, Japan, China and Manchuria. Note, the 36th Infantry Division also for a time lost its 1st Battalion of the 141st Regiment on 24 October 1944 in the Vosges Mountains in eastern France. The attached 442nd Regiment was sent into rescue them. On 1 May 2004, the 49th Armored Division of the Texas Army National Guard was officially deactivated and the 49th Armored Division was redesignated the 36th Infantry Division. After half a century, the "Fighting 36th" was reactivated and carried on the legacy of the 36th Division. 36th Infantry Division soldiers instruct Honduran soldiers. In January 2004, 74 soldiers from Alpha Battery (TAB), 2nd Battalion, 131st Field Artillery were activated for federal service in support of Operation Iraqi Freedom. Alpha Battery commanded by CPT Alvaro Gomez entered federal service in Fort Sill, OK. Under the supervision of 1SG Alfredo Barrera, the soldiers trained and deployed to Iraq. While readying their equipment in Kuwait, Alpha Battery was given her mission and the five radar sections were split up. One AN-TPQ37 radar section (SSG Gonzales) was attached to the 1st Marine Division in Al Taqadum another (CW4 Earnest Metcalf) was assigned to the 1st Infantry Division at LSA Anaconda and the three AN-TPQ36 radar sections (CW2 Davidson, CW2 Bien, and SSG Johnson) were assigned to the 2nd Infantry Division in Mosul. The headquarters and support platoon (1LT Christopher Galvan) operated out of Forward Operating Base Freedom in northern Mosul. In addition to the target acquisition mission, the support platoon supplemented patrols conducted by the 25th Infantry Division Fires Brigade FIST Team and provided security for the FOB's perimeter by manning the entrance gates and watch towers. At the conclusion of the battery's deployment, its members were awarded 3 Bronze Star Medals, 1 Purple Heart Medal, 47 Army Commendation Medals, 74 Combat Action Badges, several memorandums of appreciation from command staff, and authorized to wear the unit shoulder sleeve insignia for wartime service from the 2nd Infantry Division, the 25th Infantry Division, the 36th Infantry Division, or the 1st Infantry Division. In 2005 approximately 100 soldiers of the 36th Infantry Division deployed to Bosnia for Enduring Mission 3 which was a continuation from previous IFOR and SFOR missions. When Task Force Strike left Eagle Base in Tuzla late 2006, it marked the end of an American military maneuver presence in Bosnia which had existed for almost a decade after the Dayton Accords. In 2005, over three thousand troops from the 56th BCT, 36th ID deployed to Iraq as part of the largest deployment of Texas troops since World War II. 3/133 FA, 2/142 INF were both awarded Meritorious Unit Citations for their service in Iraq. In 2005–06, 800 soldiers of 3d Battalion, 141st Infantry Regiment, 72d Brigade, 36th Infantry Division deployed to Afghanistan. The battalion was attached to the 504th Infantry Regiment of the 82d Airborne Division and earned a Joint Meritorious Unit Citation. In 2006, the 1st Squadron, 124th Cavalry Regiment, 36th Infantry Division became the first cavalry unit to serve as peacekeepers in the Sinai Desert for the Multinational Force and Observers. The force was made up of soldiers from several units of the 36th Infantry Division including 1–112th AR, 2–112th AR, 3–112th AR, 3rd Mech, and C Btry 2-131 FA (MLRS). In late 2006, Company B of the 3d Battalion, 144th Infantry Regiment deployed to Iraq after pre-deployment training at Ft. Dix, NJ and were actively engaged in combat operations. They returned in late 2007. 5 Army Commendation Medals with Valor Devices were awarded to soldiers of 1st Platoon, Second Squad in recognition of the defeat of an ambush on a State Department convoy in central Baghdad. In late 2005 to late 2006, the 36th Infantry Division was the major leading force for KFOR7, the peacekeeping mission on Kosovo. The Combat Aviation Brigade, 36th Infantry Division shipped to Iraq in September 2006 for a planned one-year deployment. On 7 May 2007 3d Battalion, 144th Infantry Regiment mobilized as "Task Force Panther" in support of Operation Iraqi Freedom. "Task Force Panther" trained at Camp Shelby, MS, and, after validation, deployed to Kuwait, and then into Iraq. On 28 August 2008, more than 3000 soldiers of the 56th IBCT again deployed to Iraq. On 15 August 2009, the 3000 soldiers of the 56th IBCT returned to Texas after 10 months in Iraq. Two soldiers from Bravo Troop 3-124 Cav, and one from C Btry 4-133 were wounded during the tour. On 10 April 2009, 136th Military Police Battalion deployed more than 150 soldiers to Afghanistan to command and run the Bagram Theatre Internment Facility. Task Force Lonestar transferred the detainees from the BTIF to the new detention facility in Parwan. 136th Military Police Battalion returned in May 2010. On 1 October 2009, the 72nd IBCT mobilized for deployment to Iraq. Upon arrival in theater, the brigade headquarters assumed authority as the Joint Area Support Group-Conditional for the International Zone, with the brigade's subordinate elements distributed throughout the country conducting detainee operations. The brigade returned from Iraq in July and August 2010, with A Battery, 1-133 FA being the last element to return home. In November and December 2010, the 36th Infantry Division Headquarters deployed to Basrah, Iraq, replacing the US 1st Infantry Division, where they provided command and control of US active Army, Reserve, and National Guard units. The 36th ID command covered 15,000 deployed military and contractor forces at 17 bases in the 9 provinces in southern Iraq. As part of the drawdown of US forces in Iraq, the division headquarters redeployed to the US starting in late August 2011, the main body following in September 2011 to Fort Hood, TX. No 36th ID soldiers were lost to combat operations during the deployment. On 26 November 2011, the newly formed 1st Battalion (Airborne), 143rd Infantry Regiment mobilized as Task Force Walker for deployment to Afghanistan. The battalion, comprising companies from Texas, Rhode Island, and Alaska, was deployed across the country in support of provincial reconstruction teams. The headquarters element was located in Kabul serving under the 648th Maneuver Enhancement Brigade (Task Force Hydra) in the Kabul base cluster. In the summer of 2012, both the 136th Maneuver Enhancement Brigade (MEB) and Task Force Arrowhead mobilized for service in Afghanistan. The 136th MEB took control of several bases in the Kabul area, while TF Arrowhead, composed of 31 security force assistance teams (SFATs), performed advisory duties with various Afghan National Security Forces (ANSF) elements in Regional Command-South. Also in the summer of 2012 the 3rd Battalion, C & D Company 144th Infantry regiment from the 56th BCT deployed to Afghanistan (RC West) as Task Force Bowie. TF Bowie provided Battalion Command Base Security, including but not limited to presences/combat patrols, assessment missions, checkpoint control and flight line security for Shindand Airbase and surrounding areas. Shindand Air Base is located in the western part of Afghanistan in the Herat province, 7 miles northeast of the city of Sabzwar. Other areas of operations included Herat city, as well as RC North. In the fall of 2012 a small detachment was sent to RC North to assist in base security operations in coordination with small regiment from the 3rd ID. In Afghanistan, 36th has deployed agricultural development teams helping build farming infrastructure, as well as security forces advising teams training Afghan national security forces to promote long-term success of the Afghan government. The 36th Infantry Division is the first National Guard Division to command an active duty brigade as part of the Army's total force policy. This allows the active and reserve units to train together as they are preparing to fight together. Currently, the 36th is in charge of an Afghanistan theatre; They will be in charge for 18 months (Two 9-month rotations). This is the first time a National Guard division has been in charge of an Afghanistan theatre this long. During the Global War on Terror, the 36th ID has been involved in numerous military operations including Operation New Dawn, Enduring Freedom, Freedom's Sentinel, and Jump Start. In February 2018, Army Times reported the 36th was deployed to Iraq to assist Iraqi forces against Islamic State. An insignia consisting of an olive drab "T" on a light blue flint arrowhead was adopted by the 36th Division in 1918. Light blue (or robin's egg blue) is the infantry branch color. The flint arrowhead represents the State of Oklahoma (once the Indian Territory) and the "T", Texas and commonly called the "T-Patch." 317th Brigade Engineer Battalion "Buffalo"
710th Brigade Support Battalion "Patriot Support"
^ "Special Designation Listing". United States Army Center of Military History. 21 April 2010. Archived from the original on 9 June 2010. Retrieved 14 July 2010. ^ "36th Infantry Division Association History". Texas Military Forces Museum. ^ a b "Souvenir Program of the Military Review, 36th Division (Panther Division)". Fort Worth Library Digital Archives. 1918. Retrieved 30 December 2017. ^ Relieved from assignment to division on 1 February 1942. ^ Remembrances: 100th Infantry Battalion 50th Anniversary Celebration 1942-1992. 100th Infantry Battalion Publication Committee. 1992. ^ Sterner, C. Douglas (2007). Go for Broke: The Nisei Warriors of World War II who Conquered Germany, Japan, and American Bigotry. American Legacy Media. ISBN 978-0-9796896-1-1. ^ Harding, Stephen (2013). The Last Battle: When U.S. and German Soldiers Joined Forces in the Waning Hours of World War II in Europe. Da Capo Press. pp. 157–161. ISBN 978-0-306-82209-4. ^ "Lost Battalion Association 2nd Battalion 131st Field Artillery and Cruiser Houston Survivors - WWII History". www.conigliofamily.com. ^ Gill, G. Hermon (1957). Royal Australian Navy 1939-1942. Australia in the War of 1939–1945. Series 2 – Navy. 1. Canberra: Australian War Memorial. p. 531. Archived from the original on 25 May 2009. ^ "US forces on guard in Iraq, even as troop levels are expected to decline". Army Times. 7 February 2018. ^ "TIOH - Heraldry - Headquarters Battalion, 36 Infantry Division". Tioh.hqda.pentagon.mil. Retrieved 28 December 2011. ^ KALB. "Fort Polk's Patriot Brigade selected for another Army first: Associated Unit Pilot". ^ daniel.ewer@ng.army.mil, SFC Daniel Ewer, Task Force 34,. "Task Force 34 Units-2-149". Minnesota National Guard. ^ "TIOH - Heraldry - 36th Sustainment Brigade". Tioh.hqda.pentagon.mil. 28 July 2009. Retrieved 28 December 2011.